This week we are celebrating the darling daisy. The pretty flower with the sunny yellow face and a ray of crisp white petals that we all love and recognise. Daisies are such a universal flower, growing everywhere in the world except for Antarctica! This sweet flower lends itself to children’s jewellery, representing purity and innocence as well as looking adoringly pretty! Many a child will have memories of sitting in their garden or in the park picking daisies and threading together a daisy chain flower garland. Can you believe that one of the longest Daisy chains ever created measured 1.31 miles! According to folklore, when you make a daisy chain it should always have its ends joined together when finished as Daisy chains are said to represent the sun, the earth, and the circle of life. Beautiful sterling silver daisy jewellery for young girls. Choose from many darling designs including this gorgeous silver bangle, adjustable ring and pretty girl’s earrings. It was once believed that dressing a child in a daisy chain would protect them from being stolen by the fairies. Daisy chains are steeped in history and in the Middle Ages they were used to treat battle wounds. Daisies were crushed to form a pulp, applied to wounds and held with bandages thought to give soothing pain relief and aid the healing process. We are all familiar with birthstones but did you know there are also traditional birth flowers? 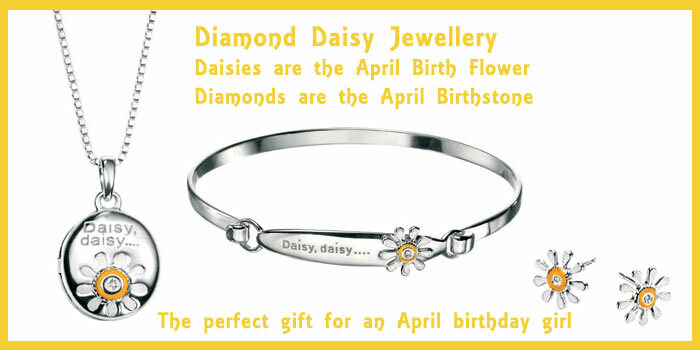 The daisy is the April birth flower, so daisy jewellery would make a beautiful as well as meaningful gift for a little April birthday girl. As a birth flower, the daisy has the meaning of implicity, modesty, innocence, stability, sympathy and cheerfulness. 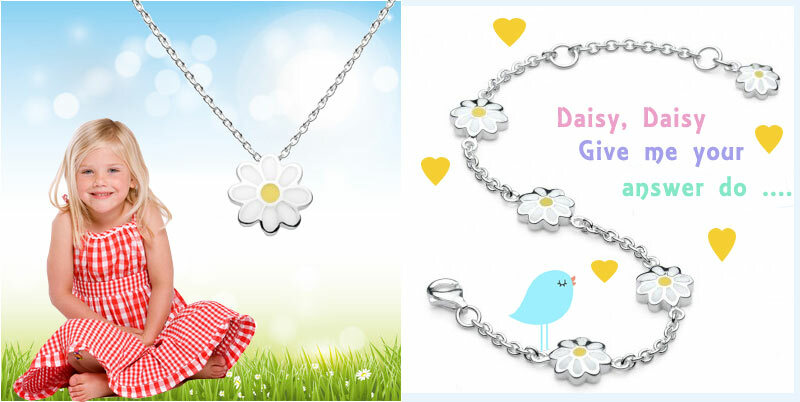 Diamond Daisy Jewellery for Children – this beautiful range of children’s jewellery featuring both diamonds and daisies is the perfect gift for any little girl with an April birthday – diamonds being the April birthstone and daisies being the April birth flower. where can I find the diamond daisy jewellery set to buy please?